John Foulsham was found guilty of an assault on bricklayer Samuel Smith. The event had taken place at the DUKE'S HEAD on 21st August 1865. Left by landowner Thomas Randall to his grandsons in 1738, one of several houses in his estate. At least 3 Lowestoft porcelain mugs are known to exist bearing the words ` Edward Amond, The Rising Sun' and dated 1768. (He was formerly a groom to the Earl of Buckingham). This sign is known to have survived at least to the late 1970's since it was propped up against a wall in one of the rooms, then used as accommodation for students. On Saturday 8th December 1860, Thomas Samuel Ward was described as an insolvent, out of business, unemployed and former landlord of the Rising Sun Inn. His debts were £230 1s with credits of £39 16s 3d. 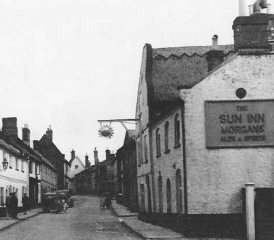 See page 1 of `Wymondham in Times Past'.